Wow, that is really great for your kids that you are able to stay home. Wow, dude, I wish I could stay home all day? Wow, do you miss working? I really like hearing the first response, the second makes me laugh on the inside, and the third one always makes me think. Regardless, I usually give the same response to all three - "I am very lucky to be staying home with my children." But, it's that third question that often resonates even after the small-talk subsides. Most of the time I do not miss teaching. 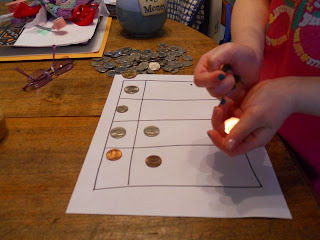 But, there are occasions that I wish I was back in the classroom working with elementary-age students. The desire to return is usually triggered after I learn something new and want to pass on my new knowledge to a group of students. I had one of those occasions this week when I discovered the MathStart Series of books by Stuart J. Murphy. What is the MathStart Series? It is a series of 63 books that are structured into 3 levels for children Pre-K to Grade 4. The series explains important math concepts that are all linked to National Council of Teachers of Mathematics (NCTM) Standards. Stuart J. Murphy describes the MathStart books as, "Pictures, words, and math coming together in a story." (TeachingBooks) With years of experience designing mathematics textbooks for various age students he learned the importance of visually presenting math concepts to children. He explains on his website, "Kids are growing up processing tremendous amounts of visual information. It has become part of their everyday language. So, if we're trying to teach them new ideas, we should try and speak to them in that language." My children and I loved the Visual Learning components of each MathStart book and found them very beneficial. We interacted with number lines, diagrams, and many illustrations. We ran our fingers along a number line while reading 100 Days of Cool. 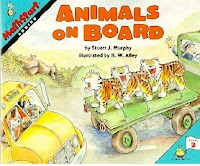 We counted animals and reviewed an addition number sentence after reading each page in Animals on Board. We found ourselves treating the visuals as if they were as important as the words of the story. 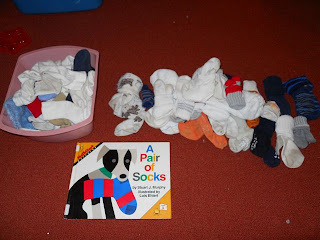 My 3 year old son and I read Pair of Socks, illustrated by Lois Ehlert a book that presents the math concept of matching. 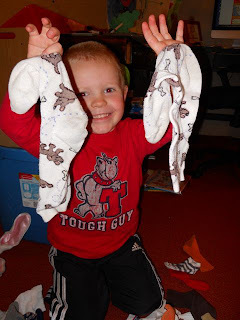 The activity suggestion was to find some mismatched items in the house and talk with your children using vocabulary from the book. I immediately thought of my heaping box of mismatched socks! I dumped them in front of my son and he said, "Whoa, Dad. 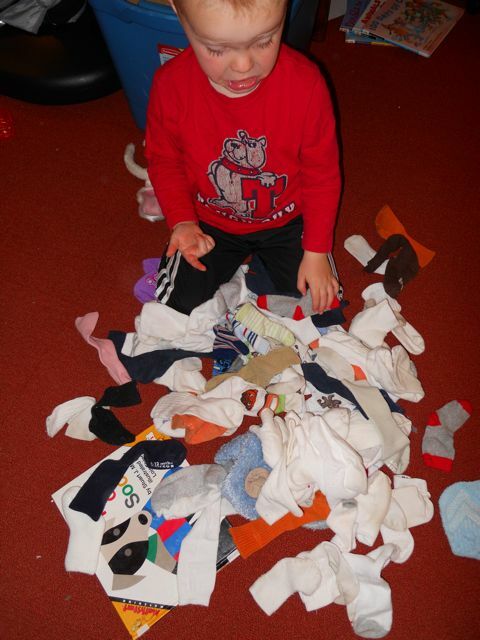 That's a lot of socks!" and what made them different or the same. matches we found. I asked her "If there are 24 pairs, how many socks are there in all?" 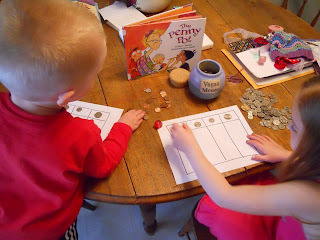 My 5 year daughter and I read Penny Pot, a book about counting coins. out that number of pennies. when we had enough. The winner was the first person to get to 25 cents. We played a series of games until one of us got to $1 in quarters. My daughter won and I let her keep the dollar. She just said to me at bedtime, "Can we play that money game tomorrow?" I said, "You just want to play it because you won money." Some people try to avoid birthdays. Instead, I love them! Mine. Those of others. And the more fanfare, the better! Therefore, when I was asked about a favorite birthday memory, I had trouble picking just one. I'll start with the first that came to mind. A number of years ago, the annual meeting of the National Council of Teachers of Mathematics, NCTM, was in Las Vegas. The International Reading Association, IRA, was meeting in San Francisco the following week. I was speaking at both conferences, and my birthday was right in between. I knew that Nancy, my wife, was planning something but I wasn't sure what. One evening, as we were walking outside the Venetian in Las Vegas, I felt someone touch me. I turned around and there was my grandson, Jack. Right behind him were his parents, my son and daughter-in-law, Randy and Maureen. The next day, Randy disappeared to order lunch for us all by the pool and came back with my daughter and son-in-law, Kristin and Arnie, and my granddaughter, Maddie. Suddenly, our entire family was together. That was a great birthday for sure! This year, I have lots to celebrate on my birthday. First, it falls on the day after Easter. While this is not a holiday in the US, it is in Italy. It's called, "Pasquetta," or little Easter, and that's where we'll be! We're planning a big outdoor potluck luncheon party with about eighteen people - a nice international mix of Italians, English, Dutch, and Americans. Second, my MathStart series was just published in Chinese and I was recently on a seventeen-day, six-city launch of the program in China. That was really exciting! And finally, the first eight books of Stuart J. Murphy's I SEE I LEARN have now been published. The series, which focuses on social, emotional, health and safety, and cognitive skills, will eventually include a total of sixteen books. For my birthday last year, my colleague, Janet Ginsburg, gave me a tee shirt with all the characters from the series on the front. I felt like Freda, Percy, Ajay, Camille, Carlos, Emma, and Emma's dog Pickle were right there celebrating with me! As I said, I love birthdays! My wife felt she could use Percy Plays It Safe at school immediately. Many younger students have difficulty with perspective. Percy is being a monster on the playground and doesn't notice how his actions are bothering his friends. Unfortunately, it takes Percy getting a boo-boo to make him realize that he needs to be more safe on the playground. Percy makes safer choices which leads to his friends being more comfortable playing with him. Thank you Stuart for sharing your birthday message! We hope you have a wonderful get together in Italy. I had a blast reading your books with my children. 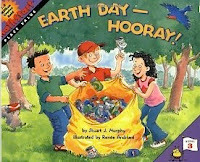 Your books would be a perfect addition to any classroom or home library. "Emma's Friendwich" from Janet Ginsburg on Vimeo.